The Danish journalist Michael Jagd, who has previously appeared in the Amorgós Island Magazine with the video “Greek dishes easy to cook”, recently made a contribution to the 3rd International Short Tourist Film Festival of Amorgos held during the YPERIA April 19th-22nd – though not taking any prices. The film is a documentary of dissemination about Amorgós with the working title ”Amorgós has many Seasons / Island of many Seasons”. The idea of the documentary is to show that Amorgós is an untamed island that you may visit almost all year round especially due to its biodiversity, beautiful walks, friendly resident population, lively folklore, nice villages and growing brand of wellness island with its spa, yoga, rakí, healing and herbs. 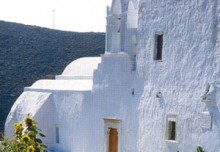 But still it is also showing the famous monastery Panagia Chozoviótissa and other local attractions. On the sound track we hear the Amorgian nisiotiko (folkloric songs from the island). 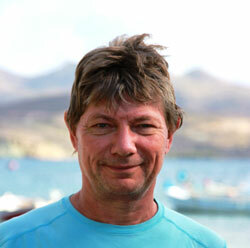 Michael Jagd has written travel guides and articles about the Cyclades. He visited Amorgós in 1978, 2005, 2007, 2008 and 2011, and in the video are recordings from 2011 with some stills from the other years. Typically to show the many seasons and types of weather here, since the time during the recordings in 2011 the weather was much like in Denmark with rain, fog, blasts of wind and low degrees bringing out warm sunny weather on the day of his departure. But fortunately the sun also was shining during the other stays. So there is a diversity of light in the video that has a duration 16:35 minutes.